SPIRou makes it halfway across the world and arrives at CFHT. 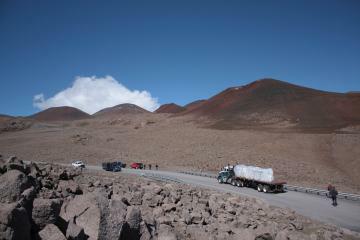 The truck transporting the SPIRou crates enters the paved Maunakea summit roas leading to CFHT (credits Z. Challita - IRAP/OMP). Astronomers and engineers at the CFHT's summit facility anxiously awaited one of the most important deliveries of the last few years. Today, the last of the 13 crates weighing altogether more than 9 tons arrived atop Maunakea. They contained SPIRou, the observatory’s newest instrument that was shipped from Toulouse, France last December, and made its way halfway around the world to the top of the world. Engineers from France, in collaboration with CFHT’s engineers, can now begin assembling the instrument that will have unique abilities to find new habitable planets outside of our solar system. 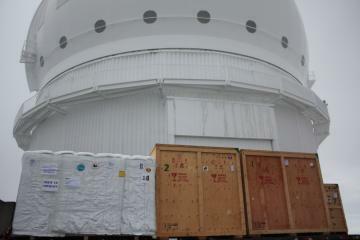 The second load of SPIRou crates is delivered at CFHT on Jan 25 (Credit: Z. Challita - IRAP/OMP). The Maunakea Observatories instrumentation programs are the key to the telescopes’ continued ranking as the most scientifically productive in the world. Each instrument can be fitted onto the telescope of their respective observatory to give scientists new, advanced capabilities for a highly specialized research. SPIRou (SpectroPolarimètre InfraRouge) belongs to the next generation of astronomy instruments with the goal of finding Earth like planets in the habitable zones of nearby red stars. 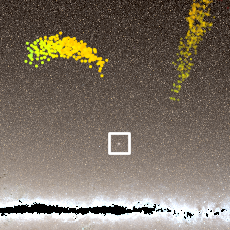 SPIRou uses a technique called radial velocity coupled with polarimetry in the infrared to detect the tiny wiggle in a star, which indicates the presence of planets, to very small levels. Along with professional astronomers, dozens of Hawaii State Department of Education high school students are eagerly anticipating the chance to use SPIRou through the observatories’ Maunakea Scholars program, which gives observing time and mentorship to students statewide. Many of the Scholars’ innovative project proposals have been beyond the boundaries of current technology, until today. 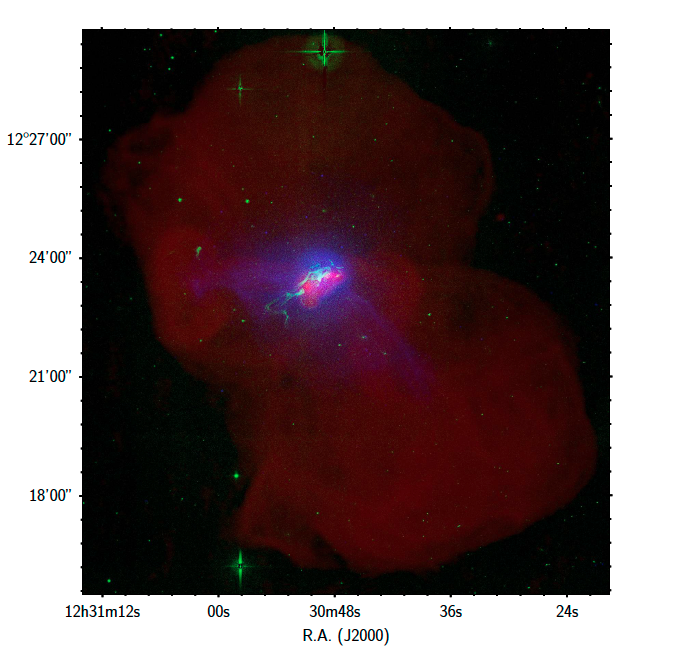 SPIRou looks at the rainbow or spectra of nearby red stars. These stars, called M dwarfs, are very cool, roughly 1000 to 2000 degrees cooler than the Sun. To measure the spectra of these stars, SPIRou operates in the infrared, wavelengths of light longer (thus redder) than the light humans can see with their eyes. As the planet orbits its star, the gravity of the planet pulls the star ever so slightly causing a back and forth motion of the star over a full revolution of the planet. SPIRou will detect the speed of this motion down 2.25 miles per hour. This is technologically very challenging. After its arrival at the summit, SPIRou will be unpacked and reassembled, a delicate process that will take a several months. Once it is reassembled, the instrument will undergo testing in the lab and on the sky before being declared ready for science. If all goes according to plan, CFHT anticipates SPIRou capturing its first light from an M star in spring 2018.